Hellman’s, or Kewpie? And does it really matter? In short: if you’re making sushi, yes, it does! 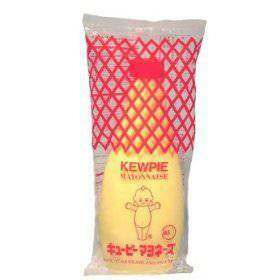 Kewpie Mayonnaise is used in Japanese cuisine primarily to infuse recipes with flavor. Be it within a sushi roll, or drizzled atop a salad, Kewpie can instantly enhance a dish with its sweet, yet tangy creaminess. Often described as being ‘fishy’ due to the presence of monosodium glutamate, Kewpie Mayonnaise is actually rather more egg-like in flavor (made from egg yolks, rather than whole eggs). Its sweetness often sees it mistaken for home-made mayonnaise, however, it is merely the use of rice wine vinegar (instead of malt) that results in its characteristically richer flavor. Kewpie itself is not a ‘type’ of mayonnaise, but a brand. Founded in 1925, the Japanese company quickly grew to prominence thanks to their novel, Kewpie doll packaging, and unique tasting condiment. Born at a time when sugary foods were scarce (due to the First World War), Kewpie Mayonnaise became instantly popular with rice dishes, Okonomiyaki (savory pancakes), and Soba (noodles). Teemed with rice, Kewpie adds an instant hit of subtle sweetness and rich egg flavor, yet, also enhances the delicate flavor of fish, such as salmon and tuna – hence its popularity as a sushi condiment. Kewpie Mayonnaise bottles are strangely malleable in comparison to those of other condiments, however, all becomes clear when you remove the lid. Every bottle of Kewpie Mayo features two nozzles: a fine nozzle for decorative work, and a larger, star-shaped nozzle for general use. Fancy making your own? There’s nothing quite like the flavor of home-made Kewpie Mayonnaise. Aside from the fact making it yourself gives you greater control over its sweetness and consistency, home-made Kewpie Mayo is also free from MSGs (monosodium glutamates). Method: Traditional Kewpie Mayonnaise can be made in under five minutes with the aid of a food processor. Simply combine one egg yolk with a teaspoon of salt, and half a teaspoon of sugar; switch on the motor, and add gradually add 1 ¼ cups of Canola Oil. Finally, add 2-3 tablespoons of rice vinegar, then blend all of the ingredients together until they are well combined. Pour the entire contents into a jar or bottle, and allow to thicken in the refrigerator for at least an hour before use.